Make Your Own Beach wedding Decoration! Dreaming of ways to bring more of a beach feel to your wedding ceremony? 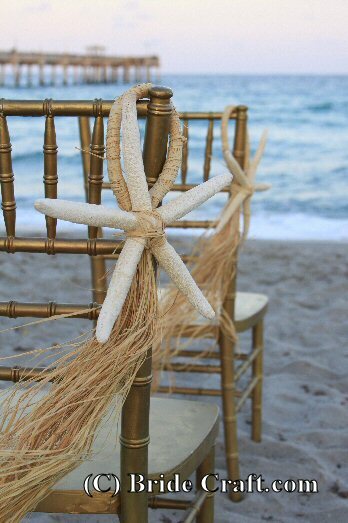 Try these easy beach wedding decorations! 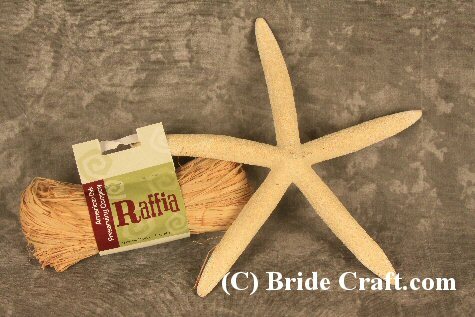 These starfish aisle markers are perfect for your wedding aisle decor. Create these pieces just like the pros at a fraction of the cost! Below you will find step-by-step instructions for creating beautiful beach wedding decorations yourself. Pros: A super inexpensive, easy to create project that can be stored for months and customized to suit your exact needs. Cons: Starfish are living creatures that humans harvest for a variety of reasons. If this bothers you, then steer clear of this idea for the wedding. If not, just keep in mind that starfish STINK until they are fully aired out. Keeping them outside on a dry day is a good way to air them out. Once the majority of the scent is gone, you can mist them lightly with your favorite perfume to mask any last bit of odor. 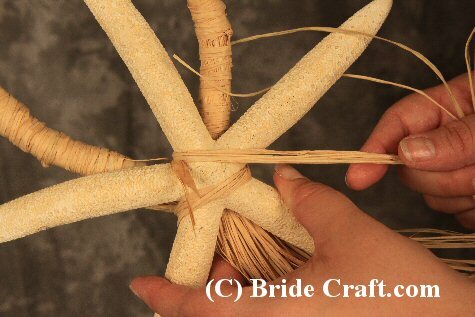 Step 1: You will need a bunch/bundle of raffia (the amount is up to you...the more raffia, the thicker he piece), and a starfish of your choosing. 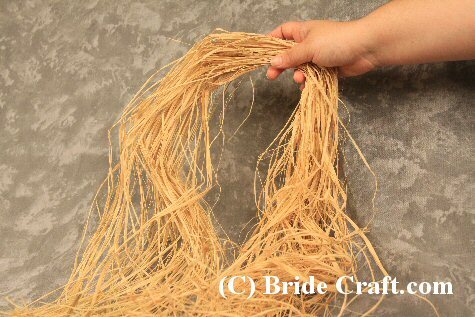 Step 2: Begin by stretching your raffia out and bending it in the center, as shown. The idea being that you have two equal sides. 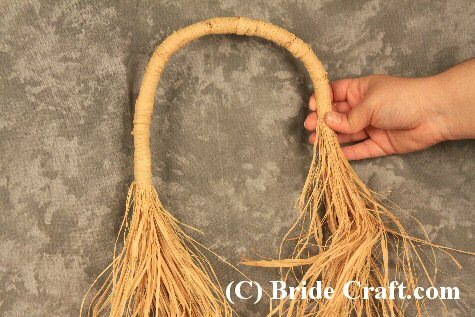 Step 3: Wind a piece of the raffia around to create a handle. Do this equally from both "sides" of the center. 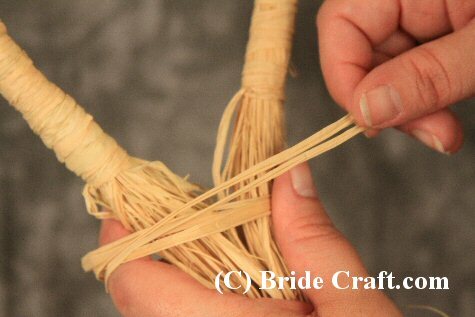 Tie the raffia in knots as you go to secure it to itself and ensure that your handle does not unravel. 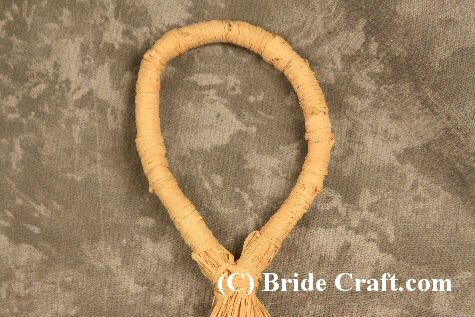 Step 4: Tie both sides of your handle together, forming a loop, as shown. Step 5: You should now have a nice, secure loop! The joining of this loop will where you attach the starfish. The loo itself will be hung over the chair, facing inward to the aisle. 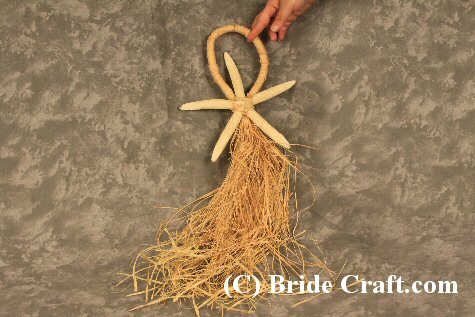 Step 6: Proceed to secure your starfish to the base of the raffia loop. Winding a piece of raffia around the starfish several times and tying it off is all you really need to do. You may use hotglue if you feel the need to secure it further. Step 7: And ta-da! Your beach wedding decoration is completed. Create as many as you see fit for your aisle. Store in a safe, dry place.